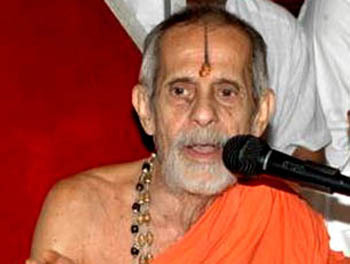 Mangaluru, June 10, 2016: Vishwesha Tirtha Swami of Udupi Paryaya Pejawar Mutt said on June 9, Thursday that he would call a meeting of experts supporting and opposing the Yettinahole project here by the end of this month or in July. The Yettinahole project, also known as the Netravati River Diversion project, is aimed at providing water to the parched districts in central/South Karnataka. Addressing media after meeting the representatives of Netravati Samrakshana Samyukta Samiti here, the seer said that there were divergent opinions between the experts and people of both regions about the project. It was essential that both the experts and people understand the opinions of one another and come to a conclusion. There should not be unnecessary misunderstandings on the issue which might lead to permanent fissures on both sides. While both sides had been making claims to support their respective positions, it was essential to know the truth about it. Hence, the presence and opinion of the experts was essential, he said. “Even if there is slight chance that the project would be environmentally catastrophic or that water might not reach in the intended area in sufficient quantity, the project should be given up,” he said. Earlier, the members of Samiti informed the seer that despite the environmental consequences and massive public opposition in the district, the State government was bent on continuing with the project. Mangaluru city experienced the worst summer in decades this year. Many hostels and some industrial and business establishments had to shut down temporarily due to water shortage, they said. “When the Netravati cannot provide water to Mangaluru during summer, how will it provide water to the parched districts of south Karnataka?” asked M.G. Hegde, activist. “We want religious heads to resolve this issue. Already there is a lot of venom being spewed on social media by supporters and opponents of the project. We do not want the situation to go out of hand,” they said. Vijay Kumar Shetty, Samiti member, said the project was intended only to benefit the politicians and contractors. The Samiti members said that they had already got the support of Mangaluru Bishop and Mangaluru Khazi on the Yettinahole issue. They would soon be approaching D. Veerendra Heggade, Dharmadhikari of Sri Kshetra Dharmasthala for his support. The Pejawa Seer is more of political than being religious . He runs institutions rand well known and respected by many but his unnecessary interference is not appreciated.